Our aim was to study how significant psychosocial factors are in occupational stress and cardiovascular diseases evolvement in workers employed at petrochemical production; we also intended to work out a set of preventive measures. Our hygienic and social-psychological research enabled us to detect factors causing stress evolvement in workers employed at petrochemical production. These factors included chemical impact, noise, unfavorable microclimate, labor hardness and labor intensity. High level of risk for their own lives and responsibility for safety of others, as well as work under time deficiency conditions with increased responsibility for the final results, were the most significant psychosocial factors for workers. In the course of questioning we detected that 74 % machine operators, 63 % tool men working with controllers and automatic devices, and 57 % repairmen mentioned having stress at work. Here 38 % workers gave a subjective estimation of their professional activity as having apparent "stress nature". The questioning revealed that 48 % workers with various occupations had increased parameters as per anxiety scale (HADS); 23 % workers had increased parameters as per depressions scale (HADS). Primary hypertension was the most widely spread nosologic form among chronic non-infectious diseases; it was found in 46.1 % operators and in 45.2 % repairmen dealing with processing stations repair. 30.1 % tool men working with controllers and automatic devices had average occupational causation of primary hypertension by production factors. We detected direct relation between hyperlipidemia and age and working period. We created foundation for preventive measures and worked out a program aimed at increasing resistance to stress at corporate and individual level. It will provide significant social effect and later on economic one. To overcome social stress we need to create safe working conditions at workplaces and to increase labor motivation based on career development possibilities. Bikkinina G.M., Kaybyshev V.T. Otsenka znachimosti psikhosotsial'nykh faktorov proizvodstvennoi i neproizvodstvennoi prirody dlya sotrudnikov pravookhranitel'nykh organov [Evaluation of psycho-social occupational and nonoccupational factors importance for police officers]. Meditsina truda i promyshlennaya ekologiya, 2012, no. 1, pp. 19–23 (in Russian). Bukhtiyarov I.V., Rubtsov M.Yu., Chesalin P.V.Validizatsiya otsenki professional'nogo stressa u rabotni-kov ofisov [Clerkship’s occupational stress evaluation reliability]. Ekologiya cheloveka, 2012, no. 11, pp. 20–26. (in Russian). Velichkovskij B.T. Sotsial'nyi stress, trudovaya motivatsiya i zdorov'e [Social stress working motivation and health]. Byulleten' Vostochno-Sibirskogo nauchnogo tsentra Sibirskogo otdeleniya Rossiiskoi akademii meditsinskikh nauk, 2005, no. 2, pp. 24–36 (in Russian). Matyukhin V.V., Shardakova E.F., Yushkova O.I., Elizarova V.V., Yampol'skaya E.G, Poroshenko A.S., Kuz'mina L.P. Vozdeistvie faktorov trudovogo protsessa [Impact of working process factors]. Vozdeistvie na orga-nizm cheloveka opasnykh i vrednykh proizvodstvennykh faktorov. Mediko-biologicheskie aspekty: Entsiklopediya «Ekometriya» [Impact exerted on a human body by dangerous and hazardous production factors. Medical and biological aspects: «Ecometria» Encyclopedia]. Moscow, 2004, vol. 1, pp. 344–441 (in Russian). Oganov R.G., Pogosova G.V., Koltunov I.E., Romasenko L.V., Deev A.D., Yufereva Yu.M. Depressiv-naya simptomatika ukhudshaet prognoz serdechno-sosudistykh zabolevanii i snizhaet prodolzhitel'nost' zhizni bol'nykh arterial'noi gipertoniei i ishemicheskoi bolezn'yu serdtsa [Depressive Symptoms Worsen Cardiovascular Prognosis and Shortens Length of Life in Patients With Arterial Hypertension and Ischemic Heart Disease]. Kardi-ologiya, 2011, vol. 51, no. 2, pp. 59–66 (in Russian). Chazov E.I., Oganov R.G., Pogosova G.V., Deev A.D., Shalnova S.A., Koltunov I.E., Romasenko L.V. Depressivnaya simptomatika ukhudshaet prognoz u bol'nykh arterial'noi gipertoniei i ishemicheskoi bolezn'yu serdtsa: pervye rezul'taty prospektivnogo etapa rossiiskogo mnogotsentrovogo issledovaniya KOORDINATA [De-pressive Symptoms Worsen Prognosis in Patients With Arterial Hypertension and Ischemic Heart Disease: First Results of Prospective Phase of Russian Multicenter Study COORDINATA]. Kardiologiya, 2007, vol. 47, no. 10, pp. 24–30 (in Russian). Dulyasova M.V., Tarasova L.N. Professional'nye riski personala na opasnykh proizvodstvennykh ob"ektakh neftekhimii i khimii [Occupational risks for staff employed at dangerous petrochemical production facilities]. Aktual'nye problemy sostoyaniya i razvitiya neftegazovogo kompleksa Rossii: materialy 5-oi nauchno-tekhnicheskoj konferencii [Vital issues of contemporary state and development of Russian petrochemical industry: materials of the 5th scientific and technical conference]. Moscow, 2003, 51 p. (in Russian). Izmerov N.F., Matyukhin V.V. Professional'nyi stress s pozitsii meditsiny truda: stressory, psikhofizio-logicheskie aspekty, zdorov'e, profilaktika [Occupational stress in labor medicine: stressors, psychophysiological aspects, health, and prevention]. Materialy II Vserossiiskogo s"ezda vrachei-profpatologov [Materials of the II All-Russian congress of occupational pathologists]. Rostov-na-Donu, 2006, pp. 309–310 (in Russian). Kardiovaskulyarnaya profilaktika: natsional'nye rekomendatsii [Cardiovascular prevention: national recommendations]. Kardiovaskulyarnaya terapiya i profilaktika. Moscow, 2011, vol. 10, no. 6 (Appendix 2). Available at: www.gnicpm.ru/UserFiles/kardiovaskulyarnaya%20profilaktika.pdf (12.09.2016) (in Russian). O promyshlennoi bezopasnosti opasnykh proizvodstvennykh ob"ektov: Federal'nyi zakon № 116-FZ ot 21.07.1997 (deistvuyushchaya redaktsiya, 2016) [On production safety of dangerous production facilities: Federal Law dated July, 21, 1997 No. 116-FS (the latest version came into force in 2016)]. Available at: http://docs.cntd.ru/document/9046058 (20.09.2016) (in Russian). Gabibov F.G., Bagirov K.A., Odzhagov G.O., Eviev V.A. Obespechenie bezavariinosti opasnykh ob"ektov na predpriyatii khimicheskoi, neftekhimicheskoi i neftepererabatyvayushchei promyshlennosti [Providing acciden-tlessness of dangerous objects at plants of chemical, oil-chemical and oil-processing indastry]. Vestnik Kalmytskogo universiteta, 2014, vol. 23, no. 3, pp. 46–50 (in Russian). Oganov R.G., Kontsevaya A.V., Kalinina A.M. Ekonomicheskii ushcherb ot serdechno-sosudistykh zabo-levanii v Rossiiskoi Federatsii [Economic burden of cardiovascular disease in the Russian Federation]. Kardi-ovaskulyarnaya terapiya i profilaktika, Moscow, 2011, vol. 10, no. 4, pp. 4–9 (in Russian). Professional'naya patologiya: natsional'noe rukovodstvo [Occupational pathology: national guide]. In: N.F. Izmerov ed. Moscow, GEOTAR-Media Publ., 2011, 784 p. (in Russian). Kushnerova N.F., Merzlyakov V.Yu., Fomenko S.E., Sprygin V.G., Momot T.V., Bogdanovich L.N. Pro-filaktika stressovykh narushenii u meditsinskikh rabotnikov [Prevention of stress-related disorders in medical per-sonnel]. Meditsina truda i promyshlennaya ekologiya, 2012, no. 6, pp. 44–48 (in Russian). Rukovodstvo po otsenke professional'nogo riska dlya zdorov'ya rabotnikov. 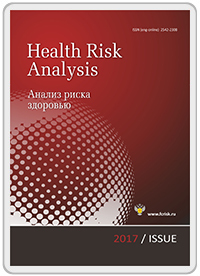 Organizatsionno-metodi-cheskie osnovy, printsipy i kriterii otsenki R 2.2.1766-03 [Guide to professional health risk assessment for workers. Organizational and methodological foundations, principles and criteria for evaluation]. Moscow, Federal'nyi tsentr gossanepidnadzora Minzdrava Rossii Publ., 2004, 24 p.
Ushakov I.B., Bukhtiyarov I.V. Professional'nyi stress i psikhicheskoe zdorov'e rabotayushchego nasele-niya [Occupational stress and mental health of working population]. Materialy II Vserossiiskogo sezda vrachei-profpatologov [Materials of the II All-Russian congress of occupational pathologists]. Rostov-na-Donu, 2006, pp. 316–318 (in Russian). Bonde J. Psychosocial factors at work and risk of depression: a systematic review of the epidemiological evidence. Occup Environ Med, 2008, vol. 65, pp. 438–445. DOI: 10.1136/oem.2007.038430. Lian Y., Gu Y., Han R., Jiang Y., Guan S., Xiao J., Liu J. Effect of Changing Work Stressors and Coping Resources on Psychological Distress. J Occup Environ Med, 2016, Jul., vol. 58, no. 7, pp. e256–263. DOI: 10.1097/JOM.0000000000000777. Hamer M., Stamatakis E., Steptoe A. Psychiatric hospital admissions, behavioral risk factors, and all-cause mortality: the Scottish health survey. Arch. Intern. Med, 2008, vol. 168, no. 22, pp. 2474–2479. Hoven H., Wahrendorf M., Siegrist J. Occupational position, work stress and depressive symptoms: a pathway analysis of longitudinal SHARE data. Journal Epidemiol Community Health, 2015, vol. 69, no. 5, pp. 447–452. DOI: 10.1136/jech-2014-205206. Karasek R., Theorell T. Healthy work. Stress, productivity, and the reconstruction of working life. New York, Basic Books Publ., 1990, 381 p.
Hirokawa K., Ohira T., Nagayoshi M., Kajiura M., Imano H., Kitamura A., Kiyama M., Okada T., Iso H. Occupational status and job stress in relation to cardiovascular stress reactivity in Japanese workers. Prev Med Rep, 2016, vol. 19, no. 4, pp. 61–67. DOI: 10.1016/j.pmedr.2016.05.010. Tsutsumi A., Kayaba K., Kario K., Ishikawa S. Prospective study on occupational stress and risk of stroke. Arch. Internal Med, 2009, vol. 169, no. 1, pp. 56–63. DOI: 10.1001/archinternmed.2008.503. Rajani N.B., Giannakopoulos G., Filippidis F.T. Job insecurity, financial difficulties and mental health in Europe. Occupational Medicine, 2016, vol. 66, no. 8, pp. 681–683. DOI: 10.1093/occmed/kqw111. Schnall P.L., Dobson M., Landsbergis P. Globalization, Work, and CardiovascularDisease. International Journal of Health Services, 2016, vol. 46, no. 4, pp. 656–692. DOI: 10.1177/0020731416664687. Siegrist J., Lunau T., Wahrendorf M., [et al.] Depressive symptoms and psychosocial stress at work among older employees in three continents. Global Health, 2012, vol. 8, pp. 27. DOI: 10.1186/1744-8603-8-27. Steptoe A., Kivimaki M. Stress and cardiovascular disease. Nat Rev Cardiol, 2012, vol. 9, pp. 360–370. DOI: 10.1038/nrcardio.2012.45. Lunau T., Wahrendorf M., Dragano N., Siegrist J. Work stress and depressive symptoms in older em-ployees: impact of national labour and social policies. BMC Public Health, 2013, vol. 13, pp. 1086.